Rev. Mason spent 27 years of her education career at Tyler ISD working as a teacher, elementary school consultant, Title I coordinator and principal. She was also a fourth grade teacher for three years at Chandler Elementary School in Chandler, TX. Rev. Mason retired from Texas College in June of 2017 as the college’s coordinator of alumni affairs after nearly a decade of serving her students. She currently serves as pastor of the St. James Christian Methodist Episcopal Church, and chair of the Central Texas Region Joint Board of Finance. She is also a member of the General Connectional Board of the CME Church, Smith County Appraisal District Board, Leadership Roundtable, Catalyst 100 and is a volunteer chaplain for the Smith County Sheriff’s Department. She has served as the director of teacher education and was the co-coordinator of First Year Experience at Jarvis Christian College. She has also served as chair of the division of education, associate professor, vice president for student affairs and evening and weekend programs at Texas College. She continues to impact the students of our community through her role as a member of the Tyler ISD Board of Trustees. 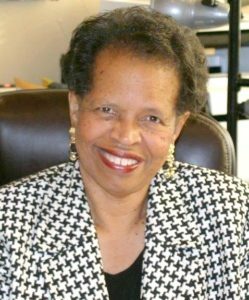 She has served on the City of Tyler Revitalization Board, People Attempting to Help Board, Tyler Parks and Recreation Board, East Texas Food Bank Board, the Mayor’s Task Force and as president of the Tyler ISD Board of Trustees. Rev. Mason is a past president of Tyler Alumnae Chapter, Delta Sigma Theta Sorority, Inc; past chaplain for the Southwest Region, Delta Sigma Theta Sorority, Inc; and the Rose City Chapter of Top Ladies of Distinction, Inc. She was also a member of Leadership Tyler Class 2. Her honors include Who’s Who in the South and Southwest, Outstanding Citizen by the Delta Sigma Theta Sorority, Inc., Outstanding Pillar of the Community by the Alpha Kappa Sorority Inc., Outstanding Woman in Tyler, and Outstanding Girl Scout Citizen to name a few. We hope you will join us in honoring Rev. Orenthia Mason at a luncheon on Friday, March 29, 2019.